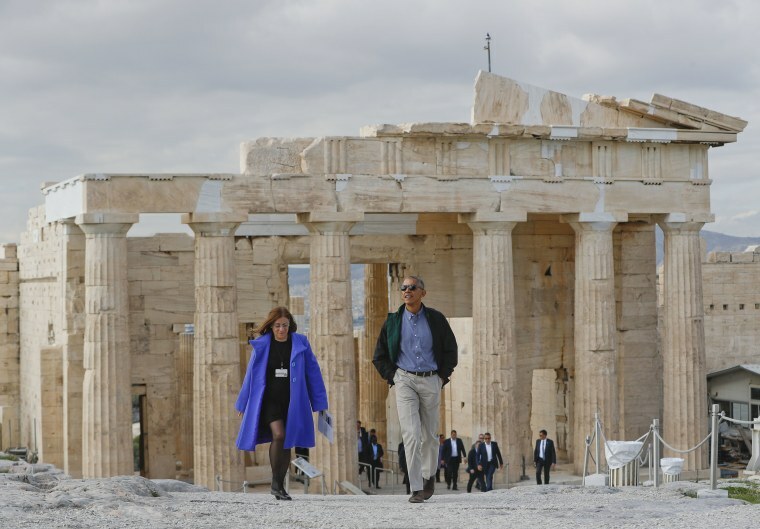 President Barack Obama, on the last foreign trip of his term, toured the Acropolis, the famed ancient citadel in Athens, as only a president can: The whole site was closed for his visit. The hilltop complex is considered a monument to free thought, artistic expression and architectural prowess. The 5th Century B.C. Parthenon temple built by Ictinus is surrounded these days by scaffolding. From the hilltop, Obama could look out in nearly every direction at sprawling Athens. Obama's visit to Greece is the first official visit by a sitting U.S. president since Bill Clinton. The next stop of Obama's overseas trip is Berlin where a speech elevated him to rock-star status in Europe back in 2008. Matthew Nighswander and The Associated Press contributed.